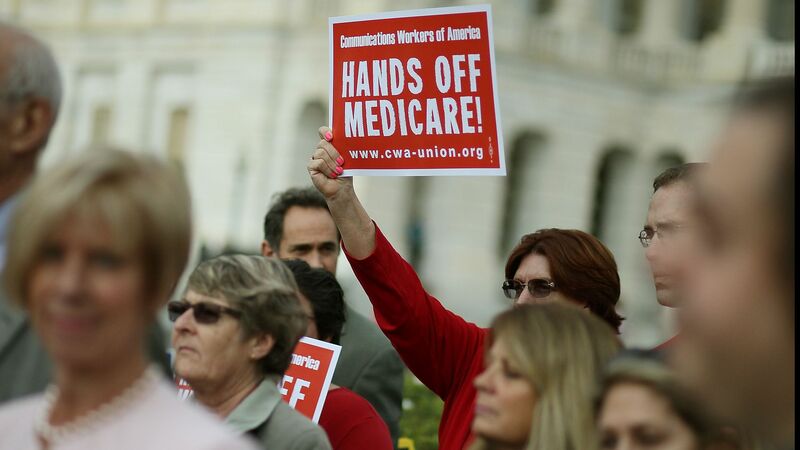 GOP campaigns attacking Democrats on "Medicare for All"
Republicans are escalating attacks on Democrats' "Medicare for All plans" — even against Democrats who don't actually support it, WaPo's Dave Weigel reports. The most ambitious forms of "Medicare for All" would be expensive, but there's not much hard evidence for Republicans' claims that they would erode the existing program. The other side: Democrats have been trying to make this election about health care, namely Republicans' approach to pre-existing conditions protections, and are happy to keep the focus on health care despite their internal divisions over "Medicare for All." What they're saying: Weigel cites three Republican incumbents – Reps. Dave Brat, Andy Barr and Bruce Poliquin – who are running ads warning voters that their Democratic opponents will hurt Medicare. Of these three races, only one of the Democrats has said they support Medicare for All. In Tennessee, the Senate Leadership Fund is running an ad against former Democratic Gov. Phil Bredesen – who's running for the open Senate seat – that says Bredesen supports single-payer health care. His campaign said in a fact sheet that he's said he doesn't support single-payer health care. Also Bredesen, on C-SPAN in 2010: “Single payer, the federal government collecting the money and then turning it over, I mean that’s what I think actually we should do. Single payer in the sense of Medicare, where government is collecting the money and then is paying all the claims, I think would be a disastrous direction for the country." Be smart: Medicare for All is both a bill sponsored by Sen. Bernie Sanders and a Democratic catch-all term for expanding government health coverage. The party will inevitably have to fight out what version of this it will rally behind. Either way, Republicans are hoping the concept proves toxic and gets their voters to turn out in November.